"The world is such a crazy place and there's so much negativity now, it's just been very nice to see a positive thing." 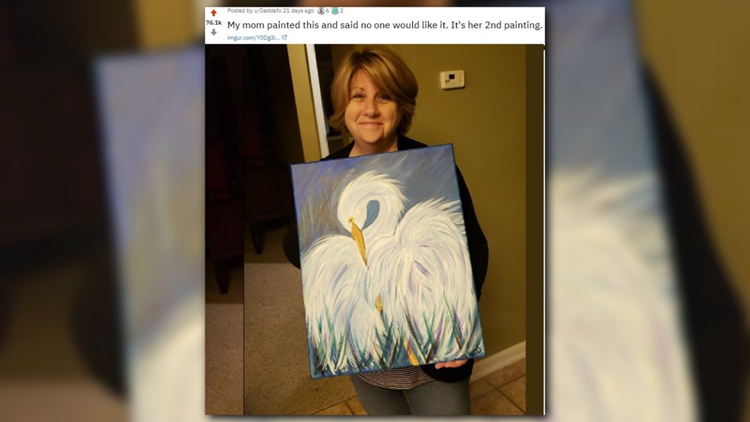 It's not a particularly good painting, but it's one of the most shared photos on the internet right now. Cindi Decker is by all accounts, a pretty normal mom. 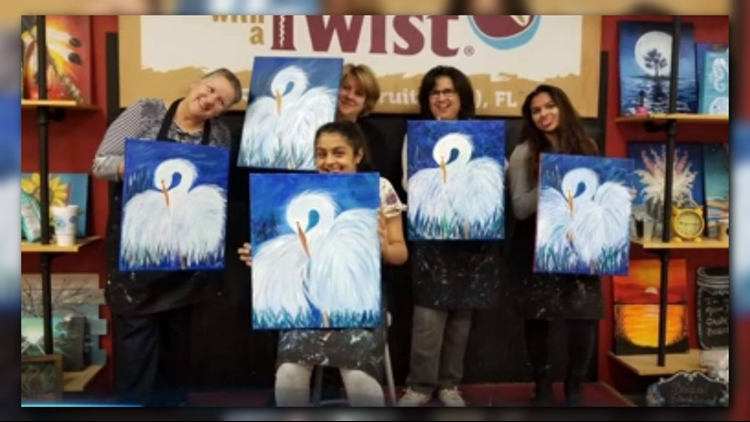 She lives in St. John's County and decided to visit a Painting With a Twist location with a friend one evening. Little did she know, that visit was going to make her an overnight celebrity. 'Florida Egret' was the assigned painting of the evening and Decker says she had a great time working on the piece. When she got home, her son was impressed by her artistry. He suggested that she sell the painting but Cindi told him she didn't think it was all that great. "My mom painted this and said no one would like it. It's her 2nd painting." A few hours later, across the globe, the painting caught the eye of an artist in Sweden who goes by the name Kristoffer Zetterstrand on Reddit. Nobody really knows why he decided to paint a picture of Decker holding her 'Florida Egret' painting... but he did. 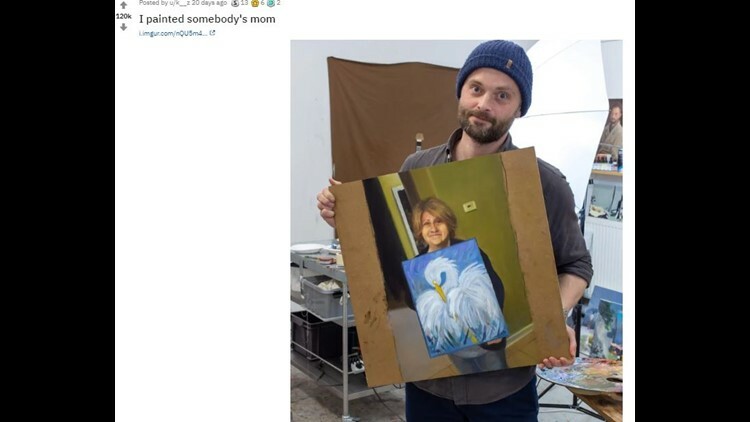 He replied to Decker's son on Reddit with the caption:"I painted somebody's mom". Nobody could have predicted what would happen next. 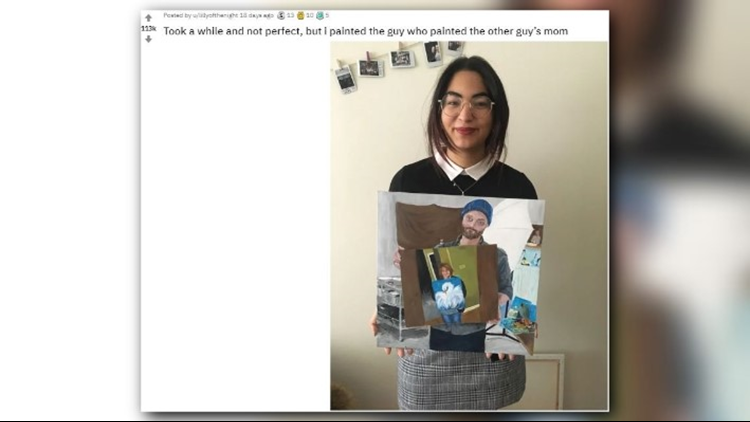 "Took awhile and not perfect, but I painted the guy who painted the other guy's mom." Basically the painting version of Inception. From there the internet did what it does best. More people started posting photos of their paintings within paintings within paintings. Now, 42 photos later, it hasn't stopped yet. To say that Decker's story has gone viral would be an understatement. Her painting and the slew of others have been featured in the Washington Post, BBC and even a Chilean newspaper. Decker says she never even knew her son posted it online. "I thought he was putting it on Snapchat but instead he put it on Reddit and it just went crazy," Decker said. She says that the whole experience has been nothing short of fantastic and that she's adjusting to her newfound attention one day at a time. "I get a lot of messages over social media, or people track me down on Facebook or my son will get them on Reddit," Decker said. "You know, it's just been such a happy experience. The world is such a crazy place and there's so much negativity now, it's just been very nice to see a positive thing."